UNU-MERIT » Global Compact on Refugees: Breaking new ground or going round in circles? Though most eyes were on the Global Compact for Safe, Orderly and Regular Migration, the UN General Assembly adopted another accord in December 2018: the Global Compact on Refugees. While labelled “a powerful expression of multilateralism in today’s fragmented world” by UN High Commissioner for Refugees, Filippo Grandi, the question remains whether the compact is simply ‘old wine in new bottles’ — as many of its topics have already received attention in the academic and policy world. Building on the 2016 New York Declaration, the document aims to engage various stakeholders through a whole-of-society approach whereby local, national and international actors work together – and are held accountable – for the protection of refugees and for seeking solutions for them throughout their displacement. Yet, questions remain about the compact’s implementation and its ability to come to a durable solution, which would traditionally mean voluntary return, local integration via citizenship, and resettlement. For the first time, a new durable solution has been recognised that is aimed at ensuring social, economic and cultural inclusion. In 2016 over two-thirds of refugees found themselves in protracted situations and this has likely gone up. This strengthens the need to find alternative ways to ensure a refugee’s right to a dignified life.Within this discussion, the concept of self-reliance is seen as the Holy Grail in and of itself. However, it is worth questioning whether self-reliance is sufficient on its own. To truly achieve these types of inclusion, we should built on the tandem of economic inclusion as well as social protection. The UNHCR wrote a Concept Note for their Global Strategy 2019-2023 on Refugee Livelihoods and Economic Inclusion. In the note, they discuss economic inclusion as access to the labour market, entrepreneurial activity or other economic opportunities. Despite recognising the right to work, the note also acknowledges that there are many de facto barriers such as lack of access to services or even limited access to the workforce. Therefore, as I argue in my own research, we need to rethink the concept of labour market engagement and inclusion. Too often we talk about labour market participation, either formal or informal, as an objective in and of itself. But we should go further and question ‘to what extent are refugees able to engage on the same level as members of the host community, given the prevalence of casual labour, informal employment and self-employment in the host society as well?’ The additional structural barriers that hinder equal participation – such as discriminatory practices, spatial segregation and dual labour markets – may lead to additional vulnerabilities such as being subject to lower wages, lack of timely pay, and/or limited access to a position aligned with their abilities. What is lacking, moreover, is the notion that even though refugees may be economically active this does not necessarily mean that they are able to adequately provide for themselves. In the long term, it is important to recognise the links between social protection, resilience and self-reliance. There ought to be a continued focus on bridging the humanitarian-development divide through transitioning from a humanitarian assistance system to a social protection framework – albeit parallel to or building on national social protection systems – as we also argued for in the Humanitarian Social Protection blog series. Unlike economic rights, no exception has been set for this under international Human Rights. By incorporating refugees in a long-term national programme, part of the stigmatisation and harmful perception of host communities towards refugees — seen merely as recipients of aid — could be circumvented. 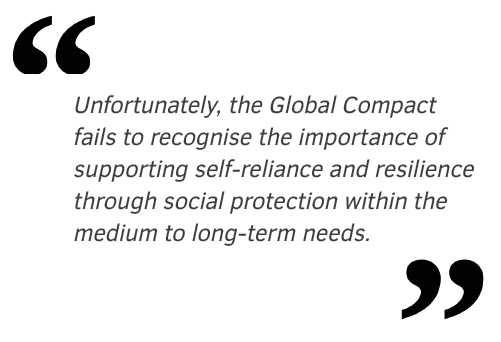 Unfortunately, the Global Compact fails to recognise the importance of supporting self-reliance and resilience through social protection within the medium to long-term needs. While the Compact contributes to the global discussion by underscoring the international responsibility towards refugees, the challenge is to make sure that the follow-up goes beyond words. Therefore, a critical look is needed at how the programme is implemented through the Comprehensive Refugee Response Framework and how indicators are set. Herein lies an opportunity for the upcoming Global Refugee Forum to not just talk the talk but also walk the walk. First, in terms of its implementation and developing the indicators, actors should recognise the importance of decent work and fair recruitment, next to adherence of ILO conventions, in their focus on economic resilience. The Global Compact for Migrants provides a stepping stone in that it seeks to address the issue of human mobility even in case of displacement due to disasters. Lessons may be drawn from this that also hold in the case of displacement as a result of conflict. Second, within the discussions on enhancing refugees’ self-reliance and easing pressures on host countries, a critical look is needed to redesign existing funding and assistance structures and move towards a system that allows for cosmopolitan burden sharing equipping durable solutions rather than ad-hoc contributions. Within such a system, we need to recognise that while economic inclusion is an admirable and essential component, support by a social protection framework in times of longer displacement is needed to truly ensure that ‘No One is Left Behind’! 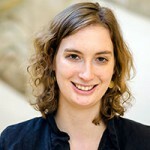 Tamara Kool is a PhD fellow in Economics and Governance at Maastricht University and UNU-MERIT. She has a particular interest in human development in fragile and conflict-affected settings. For her PhD, she further explores this setting by focusing on the impact of conflict on society and economy.